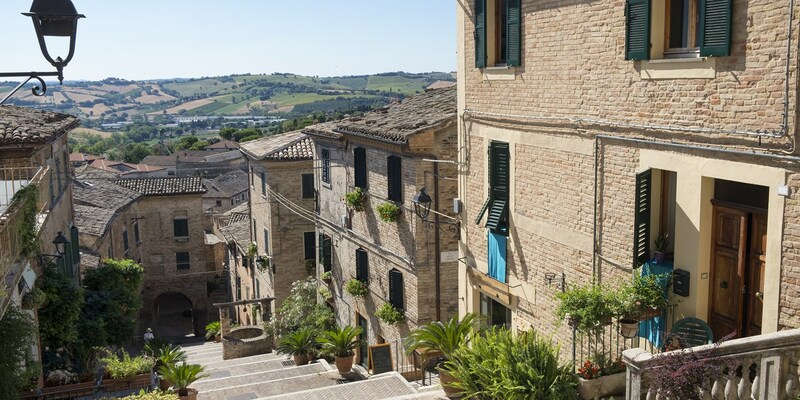 A stunning Adriatic coastline to the east, beautiful mountains to the west and an all-encompassing love for deep-fried food – Marche is one of Italy’s undiscovered gems. Read our guide for a crash course in this central Italian region’s beautiful produce, dishes and cooking techniques. 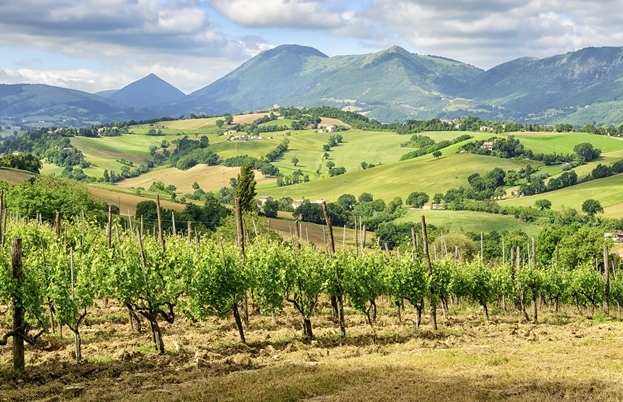 Marche (also known as Le Marche or Marches) is a region of two halves. To the east you have an incredible coastline boasting sandy beaches, bleached white rocks and pretty little seaside villages, and to the west further inland you have rolling hills which eventually turn into the Appennine Mountains. Ancona, the region’s capital, is a historically important port city, while the other provinces of Ascoli Piceno, Fermo, Macerata, Pesaro and Urbino each have their own unique characteristics. When it comes to food and drink, Marche is still a bit of an unknown. With so many well-travelled neighbouring regions (Emilia-Romagna, Tuscany, Umbria, Abruzzo and Lazio), it is sometimes overlooked. But any foodie should definitely make the trip to Marche for the stuffed, deep-fried olives all’Ascolana alone, which are a gourmet delicacy of the highest order. 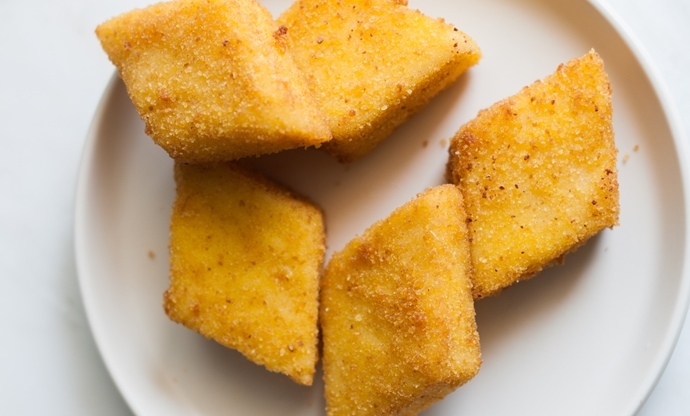 Deep-frying is a very popular method of cooking in Marche, particularly inland, while the coast offers a bounty of fish and seafood that’s often turned into soups. There are also rich pasta dishes, barbecued meats, simple stews and sweet pastries to enjoy. Take a look at the ingredients, flavours and dishes below to get a taste for Marche’s inimitable cuisine. The people of Marche eat more meat per person than anywhere else in Italy, and they’re particularly fond of grilling it alla brace – over burning wood. They’ll also batter or breadcrumb meat and deep-fry it, and turn goose, duck and rabbit into pasta sauces or roast them whole (usually stuffed with herbs and offal). 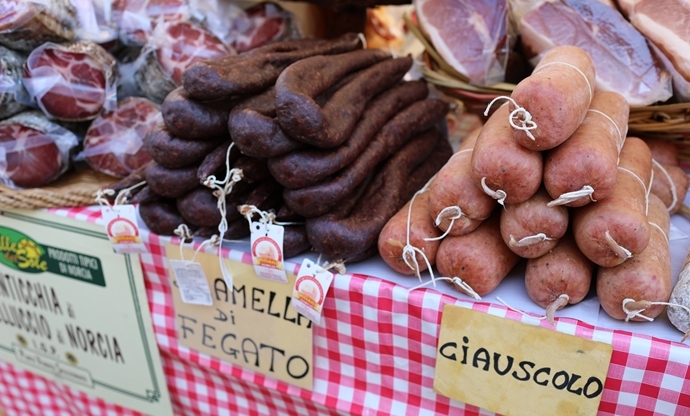 Of the many cured sausages found throughout Marche, ciauscolo has to be the most famous. Soft and spreadable like the more famous ‘nduja from Calabria to the south, it is flavoured with plenty of garlic, fennel and thyme. Do keep a look out for the local prosciutto, Prosciutto di Carpegna DOP, too, which is flavoured with juniper. 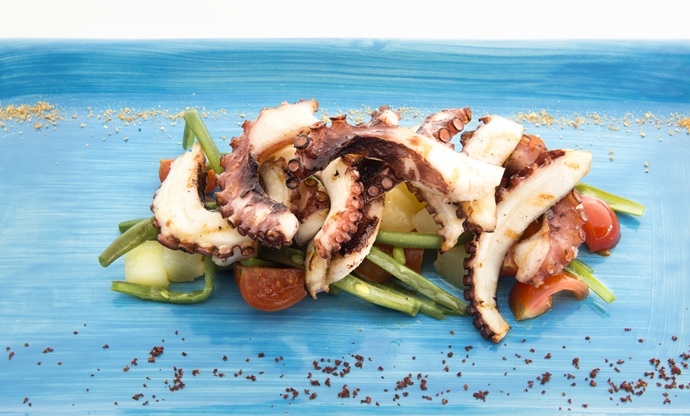 Meat might be a favourite of the Marchegiani, but along the region’s eastern coast fish and seafood is just as popular. You’ll find the day’s catch is often turned into soup (see brodetto below) or simply cooked in sauces flavoured with white wine, tomatoes or pancetta. 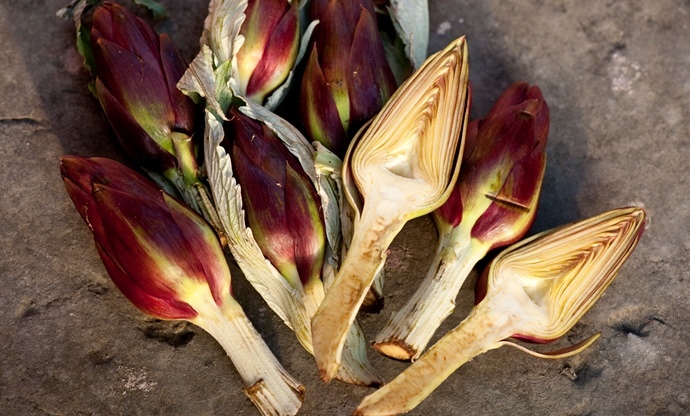 Artichokes and cauliflowers are among Marche’s most revered vegetables, while fruits such as apricots, pears, peaches and apples are held in high regard too. Pulses like chickpeas are featured in many simple soups and side dishes, too, and the region’s olives (and olive oil) are some of the best in Italy. 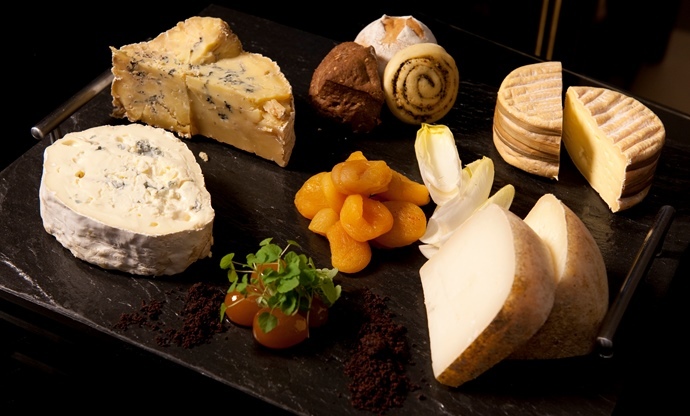 Marche’s sheep’s milk cheeses are the most well-known, particularly the PDO-protected Casciotta d’Urbino, which is a very old semi-hard cheese that was supposedly favoured by Michelangelo. Other varieties to look out for include Slattato, a cow’s milk cheese full of small holes, and Raviggiolo from Montefeltro, which is fresh and made with very little salt. The only egg pasta to be granted EU protected status in the whole of Italy makes pasta from Campofilone very special indeed. It is traditionally cut very thin and must be made with plenty of fresh eggs – no other liquid can be included in the recipe. One of the most famous dishes from Marche combines a variety of different meats, vegetables (and even set cream), batters or breadcrumbs them and, after being crisped and browned in plenty of oil, serves them on a big platter for everyone to tuck into. This method of cooking is found throughout Marche, and is often served in restaurants where families get together and work their way through giant plates of fried treats. Like its neighbour Umbria, Marche is home to plenty of truffles which make their way into local dishes whenever in season. 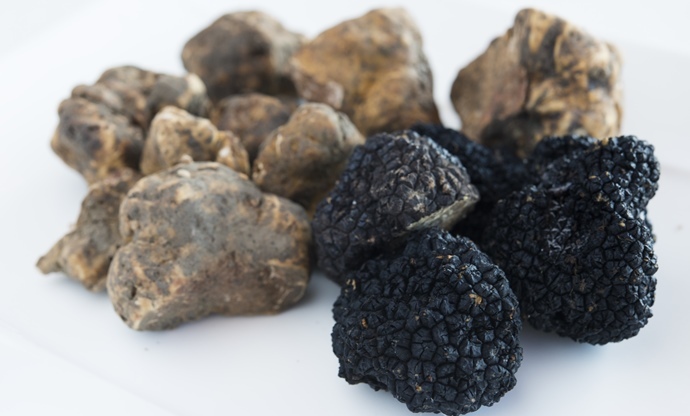 There are both white and black truffles to be found, most of which come from near Acqualagna and Sant’Angelo in Vado. Verdicchio is Marche’s most famous white wine, with flavours of crisp green apple that perfectly complement the region’s fish dishes. For reds, keep an eye out for Rosso Conero DOC and Rosso Piceno DOC, two beautiful varieties made with Sangiovese and Montepulciano grapes. Most meals in Marche are finished with an espresso and a shot of local liqueur, the most well-known of which is Anisetta, made with green anise that tastes of fennel and mint. 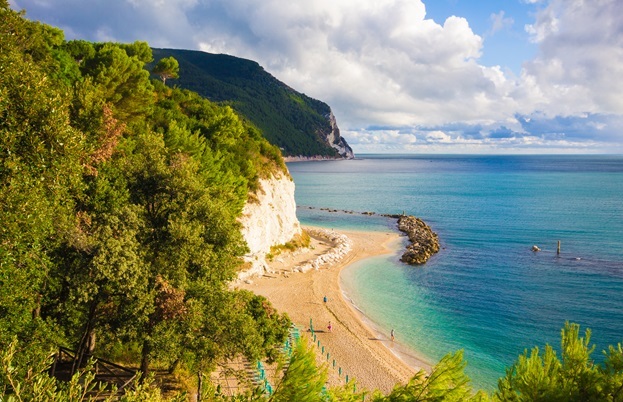 The fish soups of Marche are found all along the region’s beautiful coastline, and recipes tend to differ depending on which seaside town you find yourself in. The most famous is Brodetto all’Anconetana from Ancona, Marche’s capital, which traditionally would contain thirteen different types of fish or seafood. 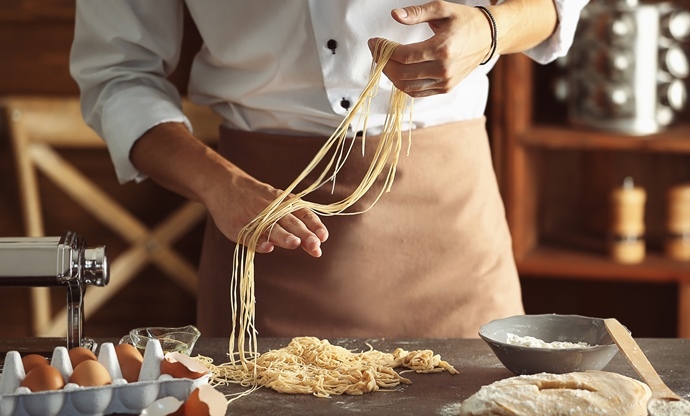 While the recipes may differ depending on where you are in Marche, all of them will contain fantastic quality produce and the soup will be kept simple to allow the flavours of the fish to shine through. 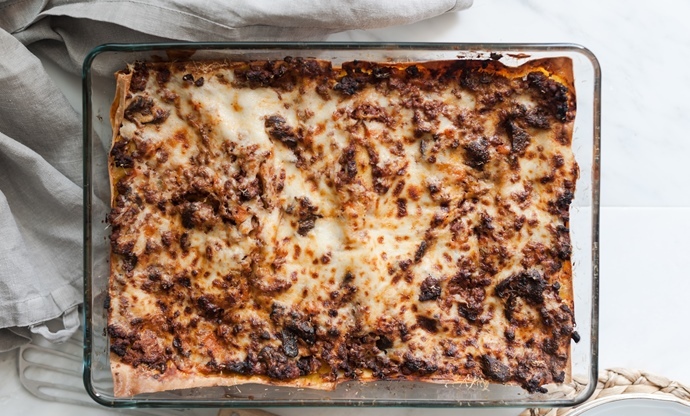 This might look like a lasagne at first glance, but the recipe is in fact an ode to just how much the Marchegiani like meat. A combination of beef, pork, sweetbreads, chicken livers and hearts is gently cooked as a ragù, before being layered up with pasta sheets and, in more modern recipes, a béchamel sauce. This dish – which has nothing to do with the more famous porchetta pork roast – sees whole rabbit stuffed with fennel, garlic and pork (often cured). It’s then seared and roasted in an oven with white wine. 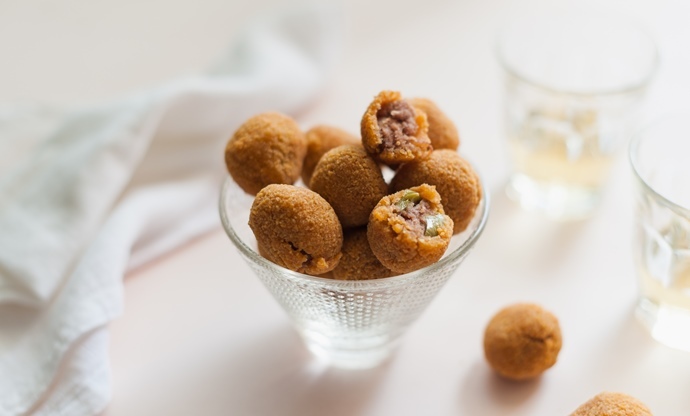 From the city of Ascoli Piceno, these meat-stuffed, breadcrumb-covered and deep-fried olives are a must-try when in Marche. Either served on their own or as part of the region’s famous fritto misto, they can be tricky and time-consuming to prepare, but the end result is well worth it. 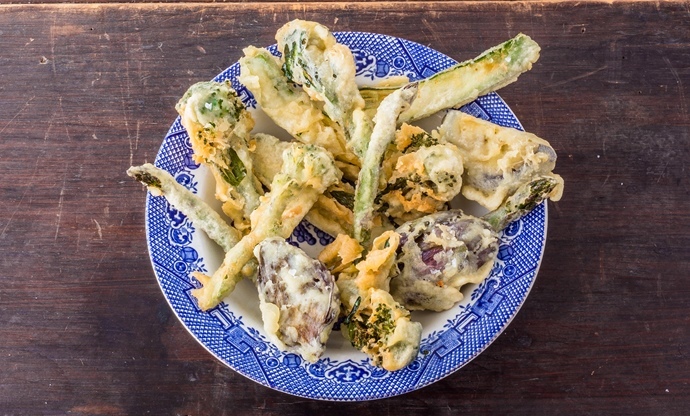 Another element of the fritto misto, this combination of seasonal vegetables is battered and deep-fried, to be enjoyed alongside olives and meats. Deep-fried cream sounds like something you’d find in the US rather than Italy, but this traditional Marche delicacy has been enjoyed for centuries. The cream is set before being cut into diamonds, battered and fried. 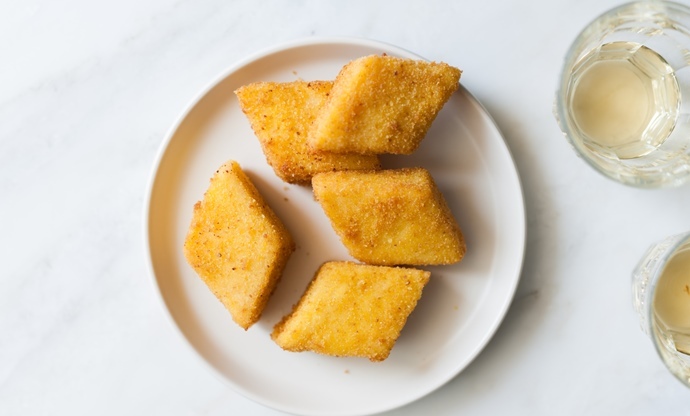 Despite its sweet flavour, crema fritta is usually served as a starter or as part of a fritto misto; it’s believed that the sweet creamy flavour contrasts with the bitter olives and savoury meats and vegetables. All of central Italy’s regions are home to simple dishes containing pulses and legumes, as they were a cheap source of protein. 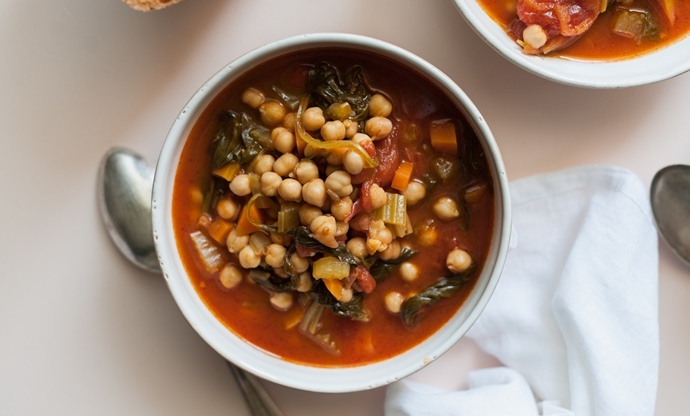 This chickpea soup is from Marche but the recipe will change depending on the time of year. The Parma ham adds a rich savoury flavour, but the chickpeas really are the star of the show. 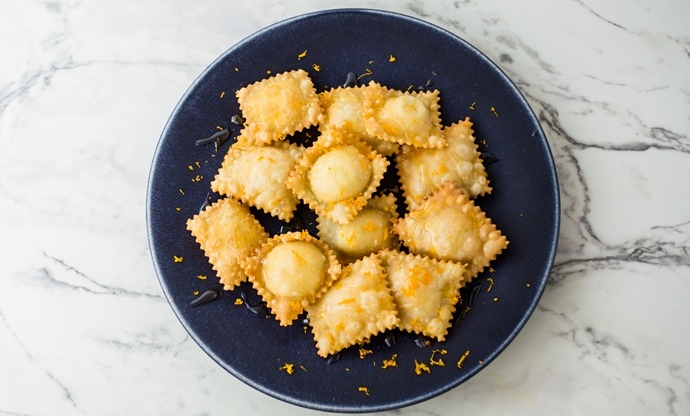 These little parcels might look like ravioli, but they’re in fact a type of shortcrust pastry that’s filled with sweet ricotta and lemon peel. They are then deep-fried (we are in Marche, after all) and served hot sprinkled with zest and honey. They’re not too sweet and not too savoury, and some variations (such as piconi) are served at the start of a meal rather than the end.